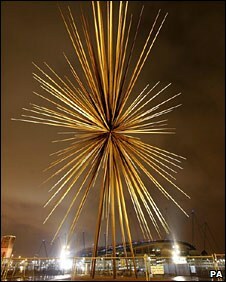 The controversial B of the Bang sculpture in Manchester looks set to be saved and rebuilt at its current home. The landmark artwork outside the City of Manchester stadium has been beset by safety problems. Nine of its 180 steel spikes have been removed after one fell off, and the sculpture remains fenced off. Officers at Manchester City Council are recommending that the landmark is dismantled and rebuilt as part of planned redevelopment at the site. The authority was set to take designer Thomas Heatherwick Studio Ltd to court over the issue until it agreed to pay £1.7m in an out-of-court settlement. Now, a report to the council's Executive Committee next week proposes two options for the B of the Bang's future. Council officers have recommended that councillors do not retain it at the current site, but take it down, store it and rebuild it later. The work is likely to cost about £1m more than the settlement figure. The council report says leaving it in place will prompt more maintenance costs, but rebuilding later will allow private or public funding to be found. A council spokeswoman said: "Officers have and will continue to work in partnership with the artist, Thomas Heatherwick and remain focused on bringing forward a solution for preserving an innovative and important contribution to public art within the city." One potential solution to the safety problems is replacing the spikes, with a carbon glass fibre material. Manchester Liberal Democrat Leader Simon Ashley said that his party wanted to "draw a line" under the sculpture and replace it with new artwork. "Frankly, this sculpture has been an expensive embarrassment from day one," he said. Last month Angel of the North creator Antony Gormley wrote to council bosses urging them not to scrap the artwork, which was built in 2005. B of the Bang was commissioned by the council to mark Manchester's Commonwealth Games in 2002.